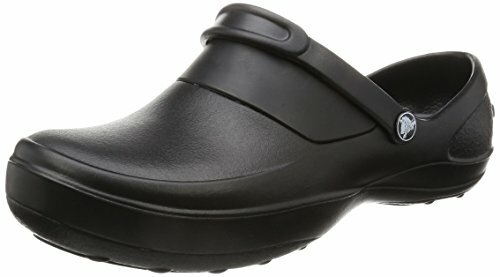 For steady steps on a variety of workplace surfaces, you'll love the Crocs Work Women's Mercy Clog. The lightweight Croslite footbed, lined with circulation nubs, softens with body heat to create a comfortable fit and help reduce pressure on your legs, feet and back. The slip-resistant Crocs Lock tread on the outsole provides excellent traction in wet or dry conditions, and the heel strap keeps you feeling stable.